I spoke to Harvey Seidel several times during the Spring of 2003 telling him the kind of horse I was looking for. He told me about a two year old gelding he had and Memorial Day weekend, on the way to a soccer tournament with my daughter, we stopped in Thermopolis, Wyoming to see Harvey and his Morgans. He showed me the gelding he had described on the phone and then introduced me to the rest of his horses including his outstanding stallion. We spent about an hour and forty five minutes together and we established a price for the horse I was considering and I asked that he give me a couple of days to mull over my decision. He said that would be fine and I was on my way. I gave considerable thought to my decision and concluded the gelding had the disposition I wanted plus other traits that I liked. I phoned Harvey to confirm my decision to purchase and sent a down payment. We agreed that I would pick the horse up several weeks later and settle up financially. 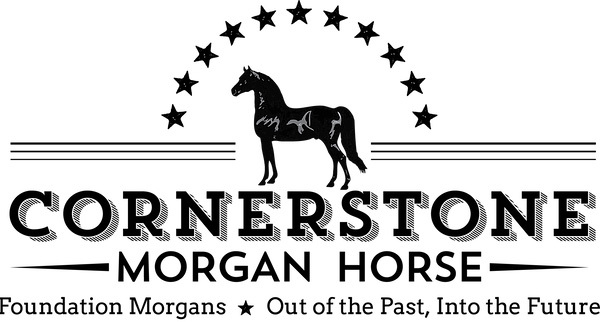 Everything went as agreed and I happily drove the horse back to my home in Southeastern Idaho and let him become acquainted with my other Morgans. 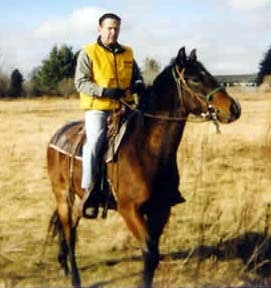 I did very little with the horse until September 2003. After work one evening I went to the pasture, put a halter on the gelding and led him out of the pasture and away from the others. I put the snaffle in his mouth with head stall on, put the blanket on his back and saddled him in about seven to eight minutes. That was his very first experience with any of those activities and he obviously did very well. I rode him several times in a round pen and then graduated to a larger (4-5 acres) pasture. A pertinent piece of information is that I am a neophyte in the horse world and do not possess great equine skills. I have only trained two other colts in the past. This colt is doing very well and I am anxious to ride him much more in the Spring and see what he will become.